Full of jQuery effects including a Nav Bar Dropmenu and a awesome Search Bar! Including Social Icon settings in the theme settings. Easily turn on/off and change URL's. Greate theme but i've got a little problem. i attached a picture and you will see the problem. This is a super nice theme. 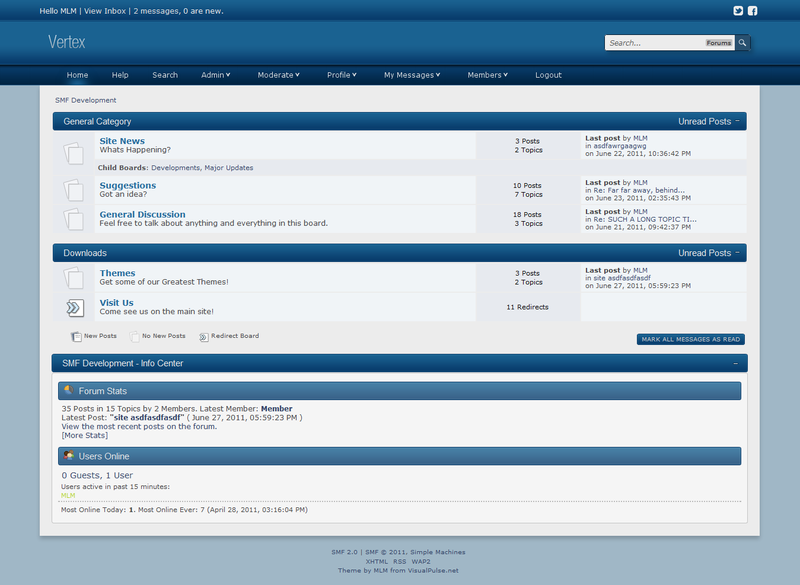 One thing though, when I go into theme settings and set my forum width to 100%, it stretches the right side of the page. After noticing this I re-installed it on a clean install of SMF, and it still does it. Does this happen to anyone else, or is it just me? I'm using both Opera and Firefox. Sorry for late response, I thought I had watched this topic but whatever. This will happen if you have too much stuff on your nav bar. You could decrease the padding(css) on the items to fit all of your stuff. Yeah, slight problem. The bar gradient on "User Info" "Top Posts" "Who's Online?" etc on Simple Portal don't stretch far enough, what is the solution for this? Grab a copy of the portal.css file from the default themes css folder and place it in your current theme css folder. Hi, this a very nice looking theme. Having tried it out I found I could not get it to display my own logo, is there a reason for this? Also I have Facebook Connect mod installed and the login button went missing, would I need to re-install it? When someone logs in, we have the option to show unread posts. My users are screaming bloody murder because the "view replies to your posts" option is missing. How and where can I add that back in? Uhh all you have to is add "?action=unread" to the url to index.php to get there. Or just add a link where ever you want with it. That's the same thing thing that is already there. The theme contains a link to Unread Posts. I need the link to "Show new replies to your posts"
Sorry misunderstood. In that case just use this: "?action=unreadreplies"
To anyone using this theme, it contains undefined errors out of the box, and depending on your settings, you will have continued problems using it. Here is the fix, for anyone interested. Fixed the issue, Overlooked because I did not think someone would turn on the setting if the fields were blank.